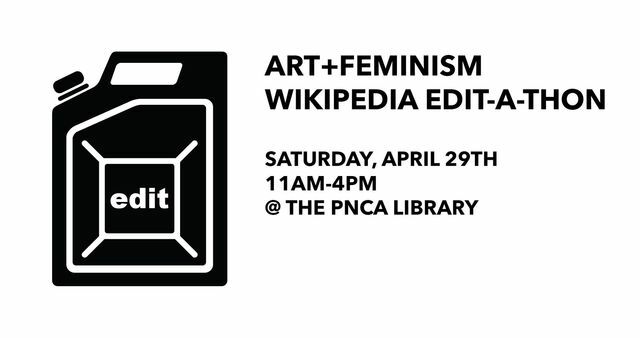 Join us for the second of two Art + Feminism Wikipedia Edit-a-Thons this Spring in Portland! These events require no previous experience and are open to people of all gender identities. Wikimedia’s gender trouble is well-documented. In a 2011 survey, the Wikimedia Foundation found that less than 10% of its contributors identify as female. While the reasons for the gender gap are up for debate, the practical effect of this disparity, however, is not. Content is skewed by the uneven gender participation. This represents an alarming absence in an increasingly important repository of shared knowledge. We all know that this bias is not just about gender. Women of color are often the least represented voices in history. We will provide tutorials for the beginner Wikipedian, reference materials, and computers (but bring your laptop if you have one!). Bring any ideas for entries that need updating or creation. Since 2014, these Art + Feminism Edit-a-thons happen all over the country (and internationally) and have been instrumental in rewriting the way women’s accomplishments are noted on Wikipedia. Join us. For the editing-averse, we urge you to stop by to show your support, learn more about this project, and eat snacks.